Strong, big, and bold, a lappet-faced vulture drives away smaller carrion-eaters, including jackals. Feasting on a big mammal’s body, this vulture tears through the thick hide, providing entrances for smaller, weaker competitors to feed. How do vultures interact with other carrion-eaters? They share carcasses amicably with carrion-eaters of other sizes. They defer to other carrion eaters, waiting to eat until the others leave. They drive off smaller carrion-eaters. Lappet-faced vultures drive off smaller carrion-eaters—even jackals. Although normally found alone or in pairs, lappet-faced vultures will sometimes congregate in small numbers, usually near water holes. Lappet-faced vultures are well equipped for getting their food, which is mainly carrion. 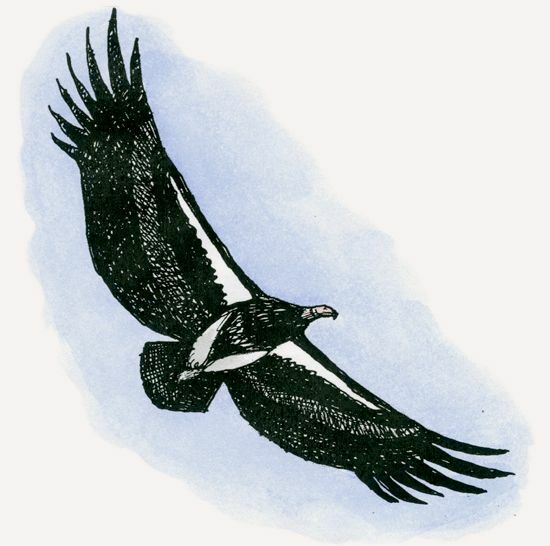 Searching for dead animals, they soar and glide on broad wings and look down with sharp eyes. A powerful hooked bill can tear into hide and sever tendons. Considering where its head must go, this vulture must appreciate having a featherless head and neck. ​The lappet-faced vulture has gone extinct in Israel, Jordan, and the western Sahara. It is listed as vulnerable by the International Union for Conservation of Nature (IUCN). Lappet-faced vultures feed mostly on carcasses, but they also attack young and weak living animals, raid the nests of other birds, and steal from smaller vultures. Lappet-faced vultures usually breed throughout the year. One egg per clutch is typical. The egg is incubated by both parents for 54 to 56 days. The chick will fledge in 125 to 135 days, remain dependent upon its parents for some time. It will not be ready to breed until it is about six years old. Lappet-faced vultures die when they eat carcasses that farmers have laced with poison to kill marauding lions. This has become enough of a problem to reduce vulture populations in many parts of Africa, including Laikipia. The lappet-faced vulture’s population in Kenya is declining and is mostly found in protected areas. Lappet-faced vultures live in parts of northern, eastern, and southern Africa. They are also found in several countries in the Middle East. 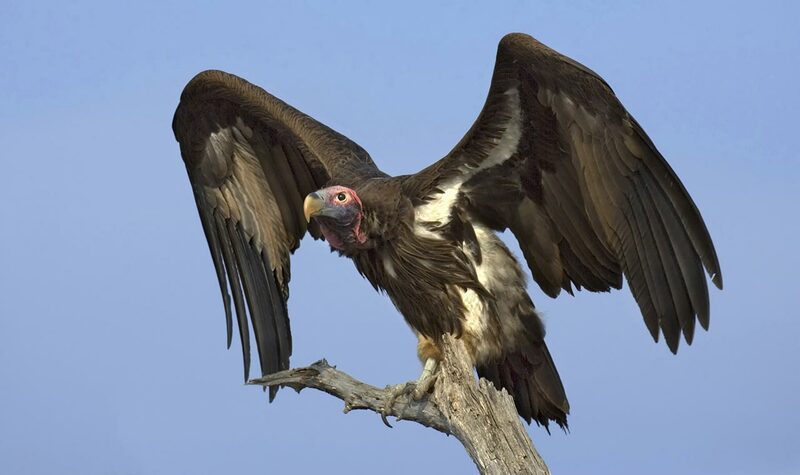 This vulture’s name refers to the wrinkled red skin on its face and neck that is reminiscent of the fashion-world’s “lappet”—the decorative flap or loose fold on a garment or headdress.